Malawi “The Warm Heart of Africa” Part 2. – Crickey…….we're in Africa! November 30, 2018 Marcus and Pauline6 Comments on Malawi “The Warm Heart of Africa” Part 2. Malawi “The Warm Heart of Africa” Part 2. We moved on from Monkey Bay to Fish Eagle Bay but not before a failed attempt at camping at a campground in Senga Bay. As we were entering the town of Senga Bay we noticed that there seemed to be a large number of people and we were stuck in a very slow moving line of traffic. That’s alright we thought after all it is a Saturday and maybe everyone was coming down to spend the day at the beach but as we came closer to the campground it became chaotic and even if we had wanted to turn around it would have been impossible especially with the Karavan on. We then were told that the campground we wer headed for was hosting a huge rock concert that night and we would not be able to access it. So how the hell do we turn around? Eventually a man came out and he organised a home owner to open his gate so that I could back into it to turn around! It was not a complete waste of time though because on the way into Senga Bay we stopped and bought some lovely fresh mangoes and also stopped and took photos of a man building his new fishing canoe. How to build a canoe, start with a big log of wood! I love playing the game of ‘Simon Says’ with the kids along the way when we stop for coffee. So we continued up the lake another hour and half and found a campsite called Nkhotakhota Pottery and stayed two nights on another great beach on the lake. This camp site is being run by a German couple who were also trying to sell a few x German 4WD fire trucks to be used for conversion into overland trucks. We were the only ones camping here and enjoyed the peace and quiet. There had been quite a bit of wind over the last few days in this location and sand had been blow up the beach and was building up against the boundary of the Lodge so the owner employed a number of local men and women to shift the sand by hand back down the beach. The owner was also in the process of extending the septic run off area by digging a longer trench and then getting the local women to carry heavy loads of rocks up from the beach which looked like an incredibly tiring job but they did this for many hours. This is a tough ob being done by tough women who always had a smile for us. Then it was Pauline’s birthday and to make it a bit special I booked two nights in a remote lodge called the Bau River Lodge in the Nkhotakota Wilderness Reserve. It is managed by a lovely couple Donna and Stephan backed by their beautiful staff and when I asked if a cake was possible they said yes of course. We were upgraded to a lodge overlooking the river and it was so quiet and peaceful you could literally hear yourself think! Donna had also left us a bottle of sparkling wine which went down a treat. Our tent for three nights. We loved the eco restaurant. Our first night we were taken on a sundowners walk by our guides Shai and Jumo and I must say you really do experience so much more when walking through wilderness areas rather than driving through them. The next morning we were up at 5.30am for a lite breakfast before setting off at 6.30am for a three hour walk with Shai, Jumo and a parks ranger who had the big rifle to protect us! We saw an incredibly number of different bird species and lots of different animals including elephant which look so much bigger when you are on foot! On return Donna had a cooked breakfast ready for us and I must say all the meals were great. Very fresh salads which the ingredients were all sourced in local villages and washed down with cold beers and nice wines. Another sundowners walk that night followed by a two hour walk the next morning were just fantastic. There is no wifi or phone signal at the lodge and we did not miss them at all. So it was back on the road the next morning and with Donna’s recommendation we headed for Makuzi Beach Lodge where we camped again right beside the beach on lovely green grass and lots of shade. Makuzi Beach from the kayak. It has it’s own private beach which is delightful and the water temperature was bang on so we did a lot of swimming. We also took a double kayak out for a paddle up the coast a bit and around a couple of islands before coming back and having another cool off swim. A tree clinging on to a rock. There is a chance that we would pick up Bilharzia while swimming in Lake Malawi so we will be taking the precaution of taking the medication after 6 weeks of swimming here. The medication is readily available here and we will take it once back in Australia in 6 weeks time. 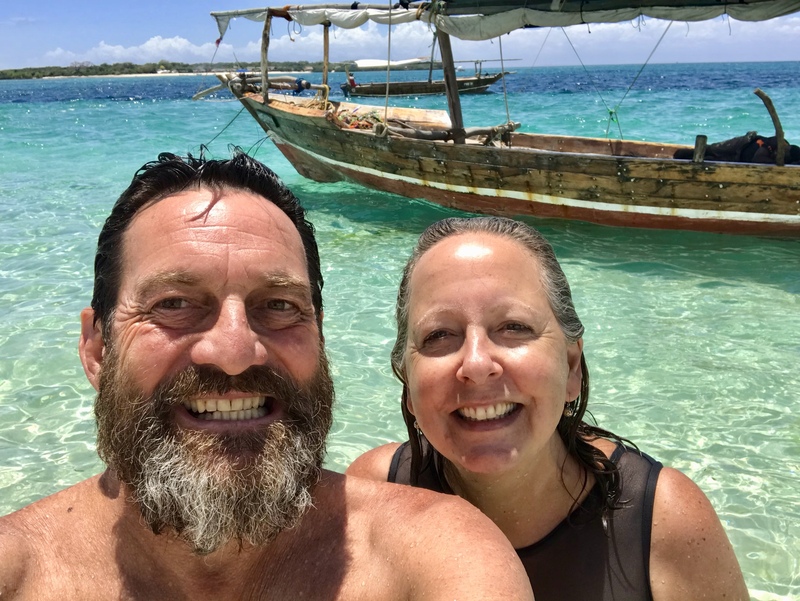 We had really enjoyed our 4 days at Makuzi Beach Lodge but with time ticking down and needing to be in Nairobi in about a months time we had to grab ourselves away. So we drove north and up to Lake Kazuni in the Vwaza Wildlife Reserve and camped in the park and right on the edge of the lake which was lovely. The chalets were very basic and cost 10,000 Kwacha or $18 Aus dollars and were very basic with cold showers and a single candle for light. However we were camping and so they opened one of the chalets for us to use the loo and shower for the cost of 7500 Kwacha or $14 Aus dollars! It was a nice camp and we saw lots of different animals coming down to the lake for a drink and that night we cooked up some very nice T-Bone steaks on the wood fired Brai (BBQ). The “Build Up” that we thought had started has stopped again and there has been no rain since South Luangwa but it is still very hot and humid so there is no real need for hot showers but rather we have been enjoying cooling off in a cold shower! A bit of a laugh is that it’s quite hilarious in Malawi that you can’t use a credit card for fuel purchases, only cash. The cost of diesel is 935.6 Malawian Kwacha per litre and we have a 180 litre tank so that means I would need 168,408 Kwacha from empty. Now the largest bank note is a 2000 kwacha note so I would need at least 84 of these to pay the bill! To compound things the maximum we can withdraw from an ATM is 80,000 kwacha per day per card so we really have to think ahead and it’s lucky we have three cards we can use although the ATM’s sometimes take Visa but not MasterCard and visa versa. Then it was on further up the island to a camp again right on the lake side run by a Dutch couple Eddie and Carmen who were very interesting to talk to. They have a 99 year lease on the lodge they run and so far have been there 12 years so have a long way to go! It was very well built and had great facilities which is not very often seen in this part of Africa. We were then only a short run of about 100 kilometres from the border crossing into Tanzania. Thanks Joan, Marcus is a wonder with these blogs ✅ it’s even exciting for me to read! 😊mozzies are definitely about, but we have chosen not to take tablets but do spray each evening, and are as careful as we can be! 🤞 so far so good! We loved Botswana too, enjoy your trip. Hi Joan, you will love Botswana and I hope you have set aside a week for the Moremi National Park because it was one of our favourite spots. Malawi was easy because the people were super friendly and the lake was awesome. The mozzies are well and truely out now and the rains have certainly started. It’s good that you have a few different credit cards. We always do and we we travel we split them up between us so there is no duplication – it means we might lose half of them but not all – perhaps. Less admin if things go wrong. See you soon in Oz perhaps. Next Tanzania the land of Police Road Blocks and ridiculous National Park fees.